Malayala Manorama Tell Me Why monthly magazine July 2014 issue Nano technology is now in stands. Those who wish to read Malayala Manorama Tell Me Why online can subscribe to it online or can buy it from the nearby book vendor. Being one of the most popular knowledge oriented book, Tell Me Why has more than 1.5 lakh subscribers. Tell Me Why, a monthly magazine from the house of Malayala Manorama has published it July 2014 issue. Like its previous editions, this issue is power packed with a lot of information. The current edition of Tell Me Why focuses on 'Nano Technology'. 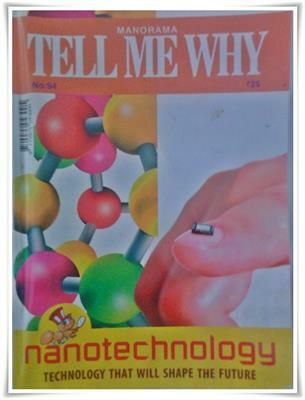 A comprehensive learning of Nanoelectornics, Nanomedicine, Nanobiotechnology and Green Nanotechnology finds its place in Tell Me Why. Young readers who are interested to know more about Nano Technology can best use this reference book to gain more knowledge. Starting from the origin of the word, Tell Me Why gives well described information on Nanotechnology while tracing the history of this scientific invention. The wonderful world of Nanomaterials is being explored. Unlimited knowledge about Nanocrystals, nanowires and applications of nanotechnology will guide readers to the informative world. It will also channelize readers to know about the importance of nanorobotics, nanomedicine and nanonephrology. Pages are dedicated to talk about the importance of green nanotechnology and its use in agricultural growth. Well depth articles on the status on nanotechnology in India and the prominent scientists who have dedicated their life for this science have also found its place in this issue. A two page Nano dictionary to clarify the important terms would be more beneficial. The reference books which come with innovative and edifying information can be wisely used to build up your knowledge. With more than 1.5 lakh subscribers, Tell Me Why is widely circulated all over India. For each its readers, Tell Me Why is a rare gem which has already won the heart of millions for its novel approach in presenting a topic. Printed in quality paper, the information is presented in very slick style. The layout very efficient with full colour features on every single page. Each edition of Tell Me Why can has a signature touch and can carefully be stored as a future reference material. This complete reference resource published for the children can also be used by people of any age. As the present issue is being designed to perfection with easy to follow question-answer format along with illustrations, cartoons and photographs, readers can get accurate knowledge. With more than 100 plus questions and their answers, you will be fortunate to live in an era which gave birth to 'Tell Me Why', the lifelong encyclopedia.